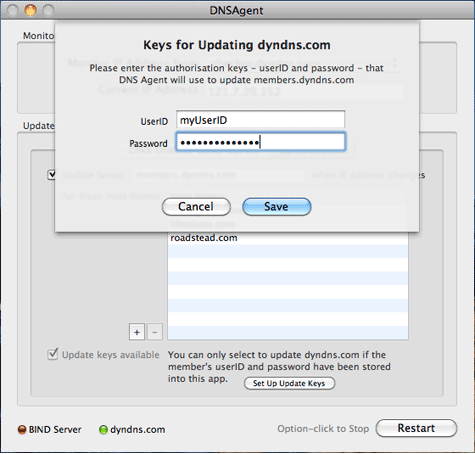 Please download DNS Agent only after buying a serial number. 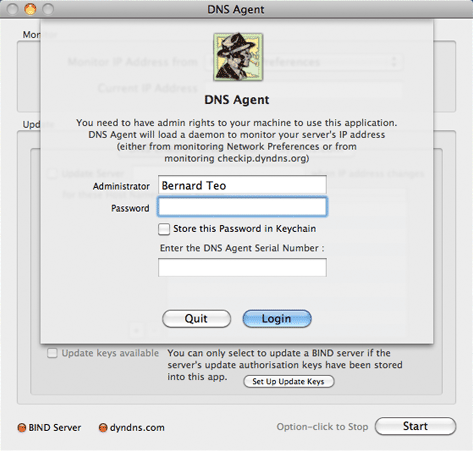 DNS Agent only runs on Snow Leopard. Make your Mac a first-class citizen on the Internet, even if you're on broadband with a dynamically assigned IP address. 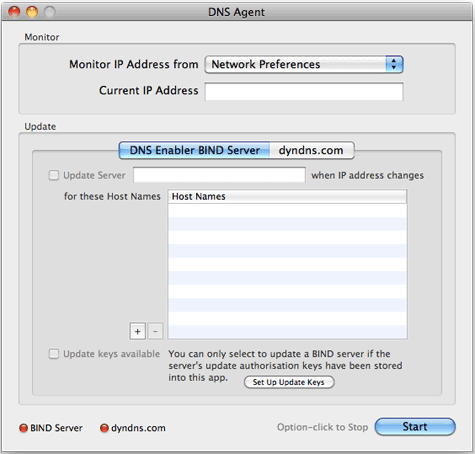 After logging in, depending on whether the DNS Server is managed by DNS Enabler Snow (the following section), or one managed by dyndns.com, go to the relevant DNS Agent tab panel. Note : The DNS Server must be running the latest 4.0.4 version of DNS Enabler Snow in order to have the dynamic DNS update capability. Once turned on, DNS Enabler Snow can be made to generate an Authorisation Key for DNS Agent to use so that it can identify itself to the server as a valid client. 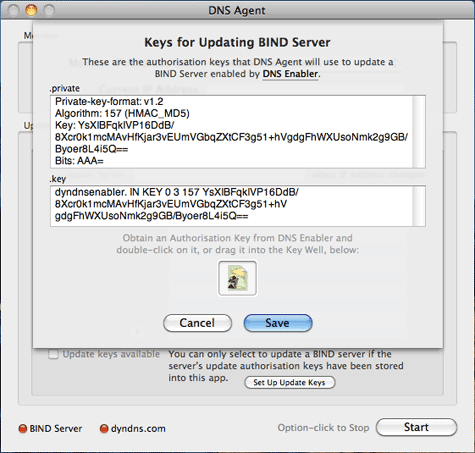 Read the DNS Enabler Snow documentation for how to obtain the Authorisation Key from the server and copy it to this client machine. The Help menu also contains a link back to this DNS Agent web page and it can be used to check the web site for new versions. 1.0 6th March 2010. DNS Agent released. 1.0.1 29th April 2010. 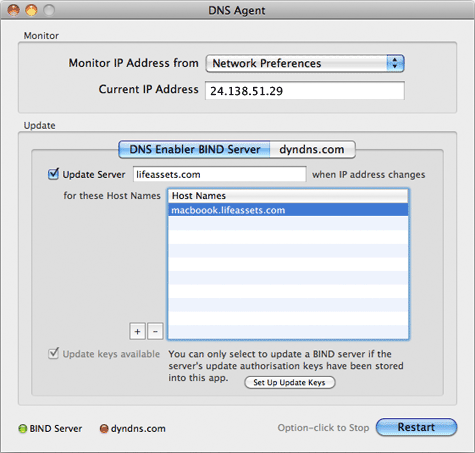 The initial version of DNS Agent does a ping of the DNS server to make sure it is available before trying to update it with the client's latest IP address. But some DNS Servers may be set to stealth mode, i.e., it doesn't respond to ping requests even though it's available for update. So this version of DNS Agent skips the ping test but continues to check that the DNS Server is actually listening on the appropriate port for updates from clients before trying to update to server. 1.0.2 9th May 2010. Objects inside the DNS Agent Log window didn't position themselves correctly when the window was being re-sized. This has been fixed. 1.0.3 13th Nov 2010. 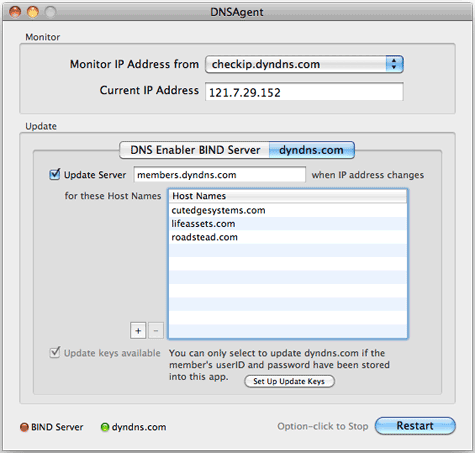 Improved DNS Agent's reliability in updating dyndns.com's servers.